Ummassar Ali Juma'a is a member of the Parliament of South Kordofan, for the SPLM. She is a mother of three and she is also the widow of Yousif Kuwa Mekki. I grew up in Kalkada. It used to be a beautiful place with plenty of water and many people. My father had a large garden full of mango trees. We are Muslems but I didn't cover my hair, and I didn't care to hide my body. Hey, when you are in the market, you have to show what you've got! My uncle didn't agree though. He was a member of the Muslem Brotherhood, he went on hadj and built a mosque in Kalkada. His wives and daughters stayed in the house most of the day, and when ever my uncle saw me running around he told me I should behave like a good muslem. So I told him: I do my prayers, I try to do the right thing in life, I treat people well and I know my own heart - what is the need for outward display? And my father told him to leave me alone. My father was killed during an attack on Kalkada. The Government army raided the village several times. In 1993 we had to flee to Komo and we stayed there. Untill 2001, no one lived in Kalkada, the armies would come and go, it was no man's land. My mother has returned to the village after the cease fire but the place is not the same. The biggest change is the water: you need to dig thirty meters to get to the water, while fifteen years ago it was just below the surface. Last month a man died trying to deepen a well that had run dry. For some reason the air on the bottom of the well was bad. The first man that went in fell down. The next one, thinking he was stronger, went down and also lost consciousness before he could even tie a rope around the first man's waist. It took two more men to get the first two out. One died, the others are still in hospital. In 1990, I applied to a course in nursing and midwifery in Changaru. I was admitted, and I got my certificate after three months. From that time on I have been treating wounded soldiers, and helping women deliver their babies. The work behind the front was difficult. We didn't have medicine to give to the soldiers, we didn't have bandages or proper suture. I stitched wounds with an ordinary needle and threads from my hair extensions. Yousif [Kuwa Mekki] and I met during the graduation ceremony for that nursing course. We went to the Head Quartes to receive our certificate, and he saw me there. Later he came to Komo to ask my family if he could marry me. They didn't agree easily! Even after I got married to Yousif, if there was any woman in the Head Quarters that had to deliver, I used my experience as a midwife to assist her. The marriage with Yousif was very good. I loved him very much and we did many things together. We were constantly moving from one area to another, because he wanted to talk to the people about the war and about the problems they were facing. I was happy with him. At the same time the general situation in the Nuba Mountains worried me very much. The people were suffering, they were struggling to survive and sometimes the Antonov would come and bombard us. During one of the Government offensives, when the Sudan Armed Forces came from all directions and the shells were falling everywhere, I remember that we ran from Komo to Lueri to escape the shelling. We were in complete panic because in Lueri also the explosions were all around us and we wanted to continue running. Then Yousif called us. "Where do you want to run now? The army is shelling us in Gidel, in Chaweri, in Kauda - there is nowhere you can hide. You might as well stay where you are. Let our soldiers deal with the Government convoys and in the mean time: stop running." He stood there, calm, without fear. Granades exploded, he didn't move. And really, there was no place we could hide. So we calmed down and waited for the shelling to end. Eventually our soldiers repulsed the Government attacks - they didn't even come near to Lueri. In 1994 I went to Kenia. We had our first baby, the situation in the Mountains was difficult and Yousif was often abroad in those years. Eventually we had three children. So I took care of the house, followed an English course and brought the children to school. I wasn't in Kenia all the time though: for years I would come and go. Yousif became ill, he became exhausted and then he passed away. I was overwhelmed with grief. I gave up my studies, I just stayed at home. It took a long time to pick up my life again. Many people ask me if I consider to get married again, but I don't feel ready. Where would I ever find a man like Yousif again? His death is not just my personal loss; it really has affected the people here in the Nuba Mountains. With the passing of Yousif they have lost so many things and the situation is not going well. Development is moving very slowly. What Yousif accomplished is that the Nuba are now proud of who they are. They will stand up for their rights. Especially in the area of women's affairs a lot has changed, because Yousif always gave his full support to the women. Before in the Nuba Mountains women's lives and knowledge were just limited to the household. Now every woman knows that she has rights; that she can participate together with the men and that she has the ability to do the same work as the men do. I am a member of the Parliament of Southern Kordofan. The Sudan People's Liberation Movement reserved twenty-five percent of the seats in the Parliament for women, and looking for candidates, they asked me too. 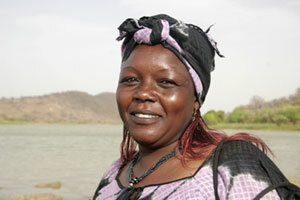 When I was younger I represented the youth, and later I became active in the Nuba Women's Union. And of course I was married to Yousif, I can't change that. The Nuba people need good representatives, and I want to do all I can to work for them. As a widow of Yousif, many Nuba people look at me as someone who can continue to practice politics in his spirit. I like this work, and I am happy to be with the people. The main difference in the life during the war and now, is the end to fighting of course. I thank God for the cease fire. It was the best thing that could happen to the Nuba people. At least they have some rest. And since the peace agreement some things have improved. There were only very few schools, and now the children continue their education in a proper way. The people who had left their places to go to the mountains, now are coming down. Still there is so much to be done. There are many difficulties in development, specially in areas that people left before and that have become bush again. Cultivation is very hard, water is not available. These are difficult areas. It is also time to talk in the Parliament about the issues of health and education. But since we took the oath on the 22nd of December, we are still in the process of drawing up the constitution, and we are in the middle of negotiations. Up to this moment, the people still keep many things inside, and those who used to live under Government administration are fearing us, and the other way around. We all have the desire to make it work. Sometimes we sit together, we participate in things, but even so, in spite of the peace, there is no openness and no frankness yet. In many ways we are still struggling. People fought and died for this peace agreement. I don't know what will happen in the future, but I hope it will bring what we wanted. I hope it will bring what Yousif dreamt of: freedom, equality and justice to all the people of Sudan.